The first of the Monstrous Lairs-pdfs clocks in at 8 pages, 1 page front cover, 2 pages of advertisement, 1 page SRD, 1 page back cover, 1 page editorial/ToC, leaving us with 2 pages of content, so let’s take a look! 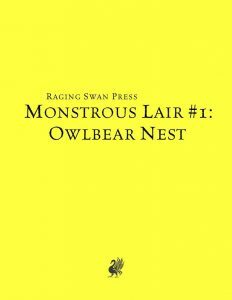 In this installment, we take a look at Owlbears and their nests: The first table allows us to describe the approach to the lair, including deep furrows or trees/columns marking the entrance. For a more organic approach, we have “What’s going on” – this table can yield results like sleeping owlbears, ones that scrutinizing a skull in its paw (Alas, dear Yorrick…) or that are just scratching against a wall – nice! 10 notable features include surrounding a massive column (topple it? ), fissures, vents or waterfalls, and for more minuscule details, a second table is provided, with hallucinogenic shrooms half eaten, bones etc. Stoned owlbear. I need to inflict that on my players. Beyond that, the pdf also provides 10 owlbear appearance customizations, like missing its feathers, being old, having a pair of rudimentary skinflaps between its upper arms, and the like – these really rocked! Treasures and trinkets have also been included – a table for each is provided, with the former including cuckoo-style cockatrice eggs in the best, encrusted, filthy silver dinnerware or neatly-tucked away rocks. Hooves with excellent horseshoes and similar remnants of past meals can also be found. Mike Welham is a master of writing amazing dressing (and designing all kinds of things! ), and it shows here – he has actually managed to inspire me with his tables, and the odd behaviors fit the strangeness that is the owlbear creature to a T. From terrain-relevant components that may influence tactics to the curiosity-inducing details, this humble pdf is a fantastic kickoff for the series. 5 stars + seal of approval. Seriously, for the low asking price, this is definitely worth checking out. You can get this cool little dressing-file here on OBS!